Download "The remote CCTV monitoring specialists CCTV Monitoring"
1 The remote CCTV monitoring specialists CCTV Monitoring Providing security and total peace of mind 24 hours a day, 365 days a year! 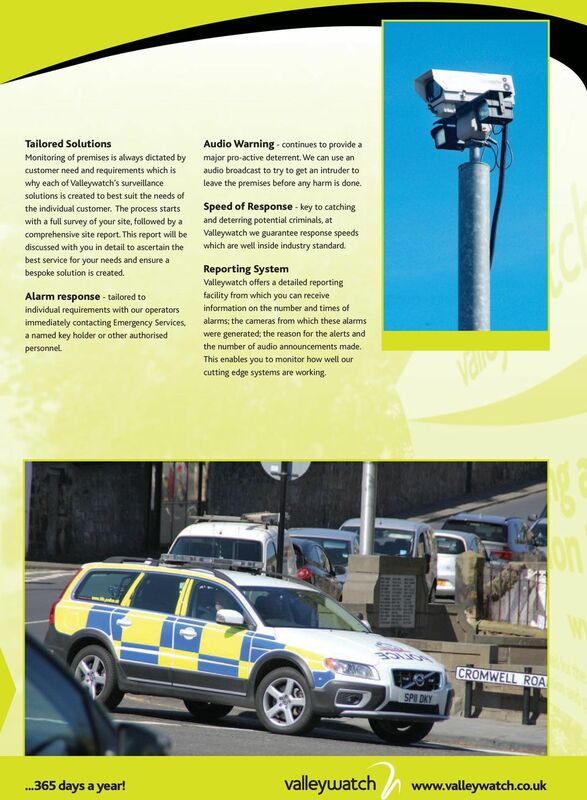 5 Tailored Solutions Audio Warning - continues to provide a Monitoring of premises is always dictated by customer need and requirements which is why each of Valleywatch s surveillance solutions is created to best suit the needs of the individual customer. The process starts with a full survey of your site, followed by a comprehensive site report. This report will be discussed with you in detail to ascertain the best service for your needs and ensure a bespoke solution is created. major pro-active deterrent. We can use an audio broadcast to try to get an intruder to leave the premises before any harm is done. Alarm response - tailored to individual requirements with our operators immediately contacting Emergency Services, a named key holder or other authorised personnel days a year! 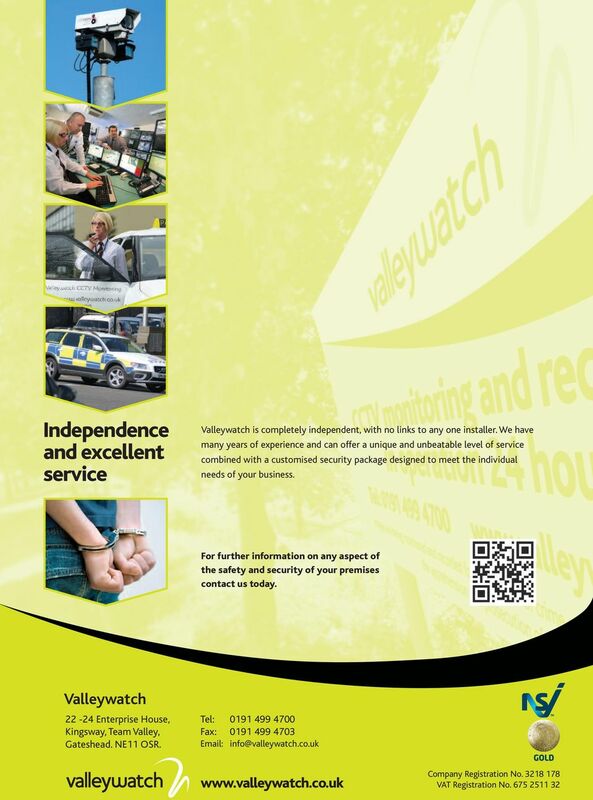 Speed of Response - key to catching and deterring potential criminals, at Valleywatch we guarantee response speeds which are well inside industry standard. 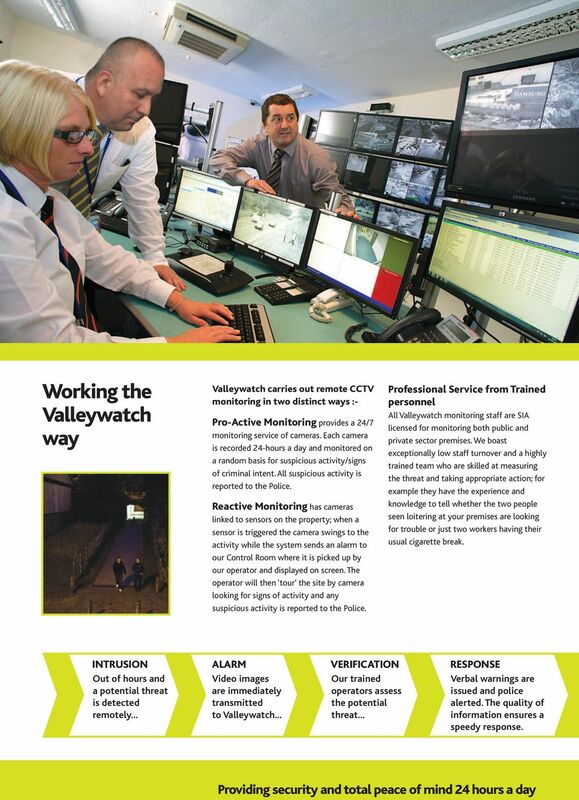 Reporting System Valleywatch offers a detailed reporting facility from which you can receive information on the number and times of alarms; the cameras from which these alarms were generated; the reason for the alerts and the number of audio announcements made. This enables you to monitor how well our cutting edge systems are working. 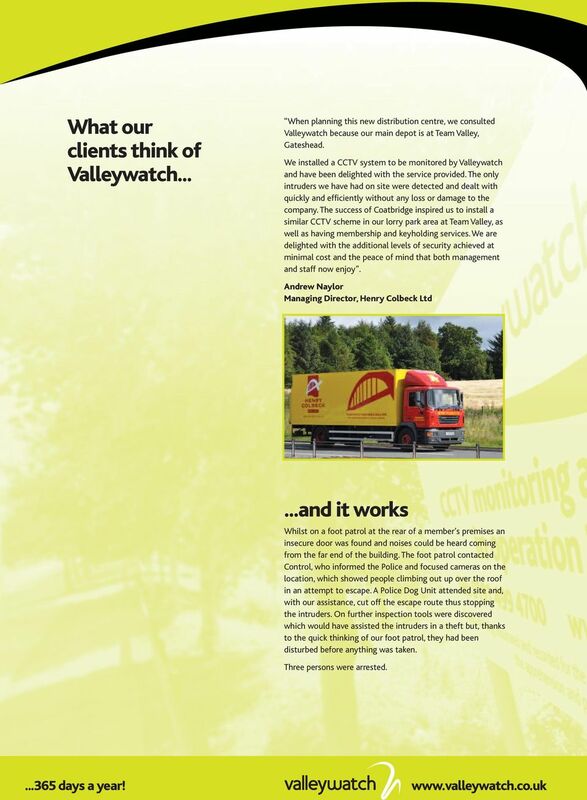 7 What our clients think of Valleywatch... 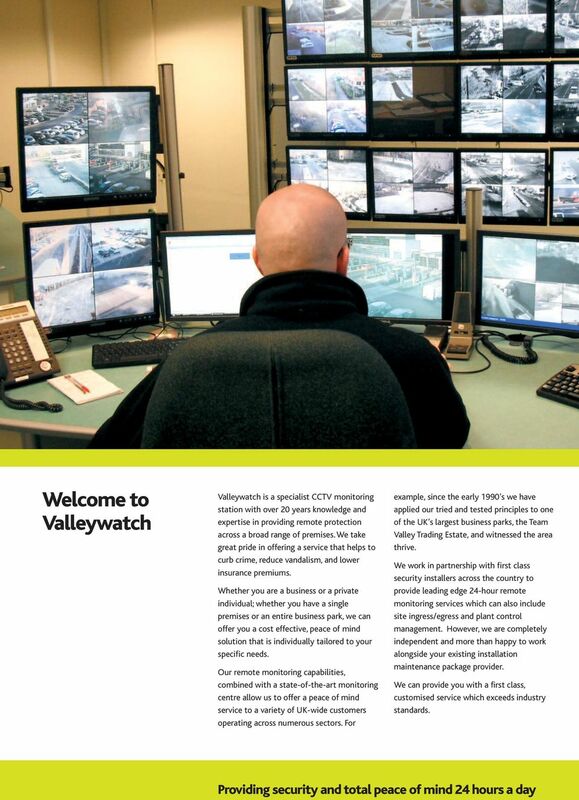 When planning this new distribution centre, we consulted Valleywatch because our main depot is at Team Valley, Gateshead. 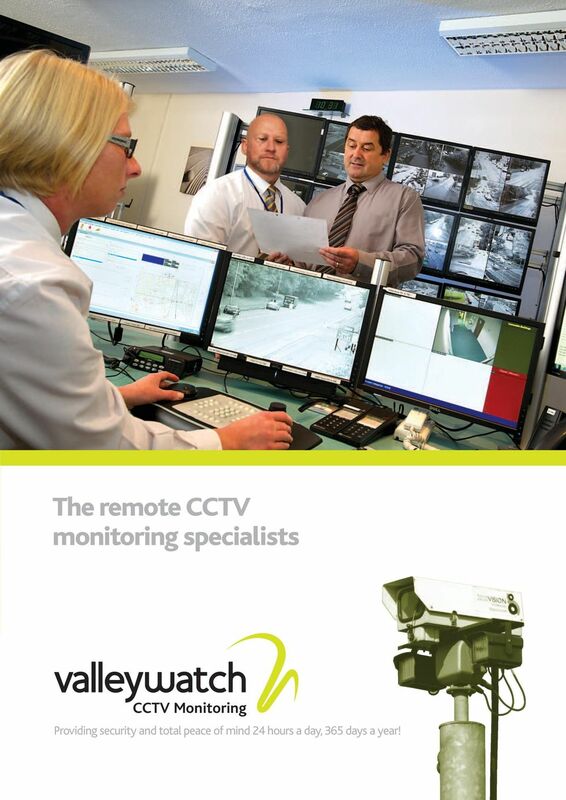 We installed a CCTV system to be monitored by Valleywatch and have been delighted with the service provided. The only intruders we have had on site were detected and dealt with quickly and efficiently without any loss or damage to the company. 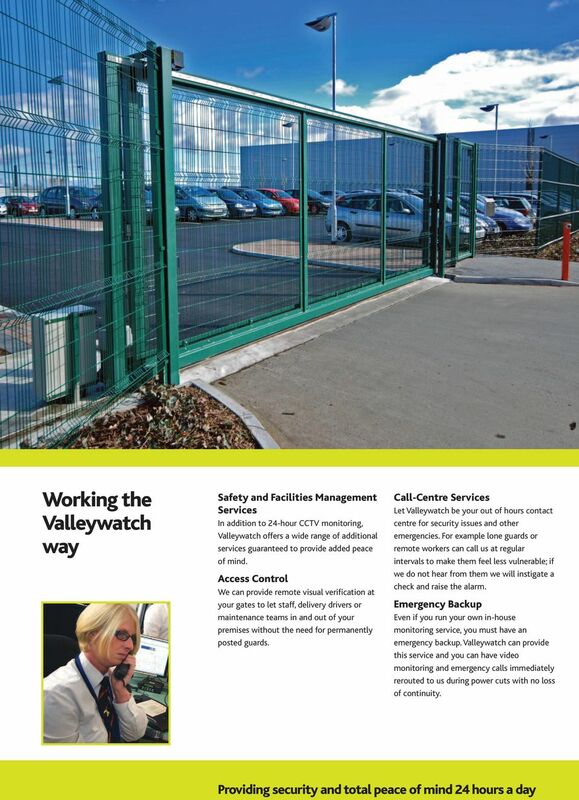 The success of Coatbridge inspired us to install a similar CCTV scheme in our lorry park area at Team Valley, as well as having membership and keyholding services. We are delighted with the additional levels of security achieved at minimal cost and the peace of mind that both management and staff now enjoy. Andrew Naylor Managing Director, Henry Colbeck Ltd...and it works Whilst on a foot patrol at the rear of a member s premises an insecure door was found and noises could be heard coming from the far end of the building. The foot patrol contacted Control, who informed the Police and focused cameras on the location, which showed people climbing out up over the roof in an attempt to escape. A Police Dog Unit attended site and, with our assistance, cut off the escape route thus stopping the intruders. On further inspection tools were discovered which would have assisted the intruders in a theft but, thanks to the quick thinking of our foot patrol, they had been disturbed before anything was taken. Three persons were arrested days a year! Safety & Security Intruder Fire Access CCTV VeriSafe Alarms Alarms Systems Systems Keeping people safe & businesses compliant www.veriserv.co. c o m p r e h e n s i v e V i d e o s o l u t i o n s What s Best for You? Protecting What s Important to You 1Local Video Surveillance Stanley is a leading provider of local video surveillance systems. 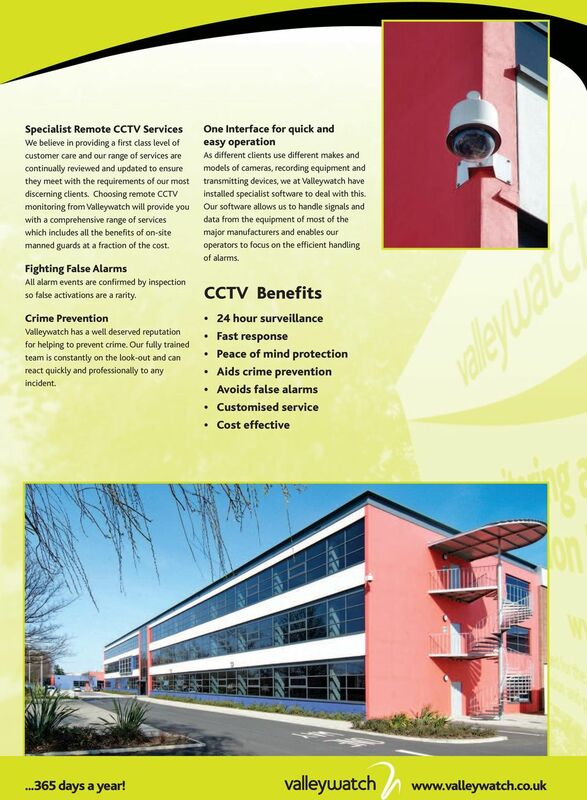 Established in 2005, Safewatch Security Systems are a security system integration company. We advance safety and security by finding smarter ways to save lives, improve businesses and protect where people live and work. BE SAFE AND SECURE. Landmark Security... giving you peace of mind. Thank you for the opportunity and privilege to introduce the services offered by Silver Space Electro Mechanical Works L.L.C. Regardless of which service you choose, our security guards are trained in administering first aid and act with high integrity in all situations. Security Alarm Response: The Benefits of Privatization Over the last 20 years, new technology has made it easier, faster and more cost effective to remotely detect security problems in homes and businesses. Multi-site security See the bigger picture THE LEADER IN MULTI-SITE PROTECTION Perimeter protection Facility protection starts at the perimeter, detecting intruders before any potential problems occur. Secure Homes Report 2013. Master Licences: VIC No. 65201491P WA No. SA42314 SA No. ISL152299 NSW No. 405187443 ACT No. 17501009 QLD No.